Vitamin D, also sometimes known as “the sunshine vitamin,” is absolutely essential for good health, and yet up to 42% of the adult population in the U.S. has low Vitamin D levels. Of the two types (D2 and D3), D3 is the more powerful and effective at raising blood levels of Vitamin D.
While Vitamin D is essential for regulating your body’s absorption of calcium. But without Vitamin K, that calcium can go where it shouldn’t, like to your organs and arteries. That’s why we made sure to balance our Vitamin D3 with a full Vitamin K complex. Most Vitamin D formulas that include Vitamin K give you only K2. We think that isn’t good enough. To get the maximum benefit from Vitamin K, you should really have both K1 and K2. Moreover, K2 comes in two separate forms – MK4 and MK 7. 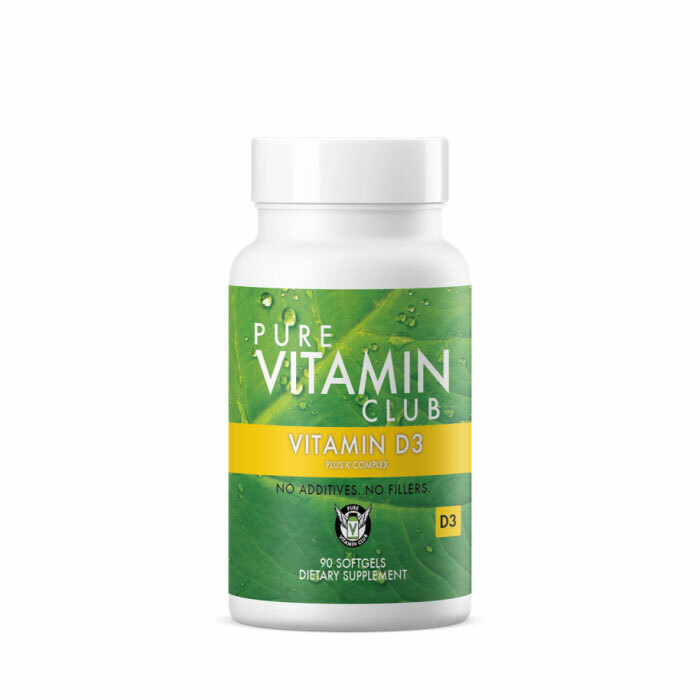 Only Pure Vitamin Club gives you the full complex of Vitamin K with our Vitamin D3. We took that one step further by using MenaQ7®, the only clinically validated, patented Vitamin K2 as MK-7 available on the market today. Finally, we wanted to make sure that our Vitamin D3 Plus K Complex formula was delivered in the best, and healthiest way possible. Most oil-filled softgels use inferior, low-quality oils. Pure Vitamin Club has an exclusive arrangement to use 100% pure, extra virgin olive oil by Villa Cappelli®, the finest olive oil available, imported directly from Puglia, Italy. 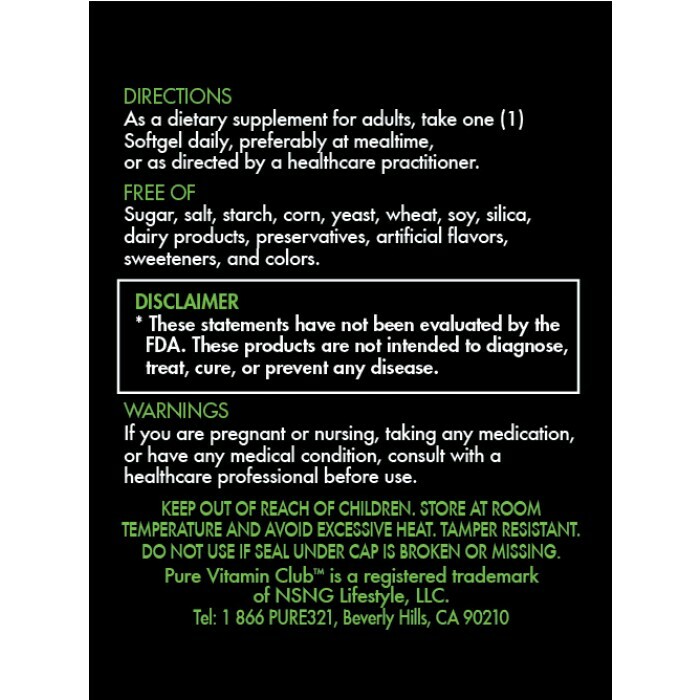 Pure Vitamin Club’s Vitamin D3 Plus K Complex comes in bottles of 90 softgels, each containing 2,000 IU of Vitamin D, 180 mcg of Vitamin K2, and 200 mcg of Vitamin K1, in a base of pure 100% extra virgin olive oil, in a gelatin capsule, and are available either by subscription or on a single order basis. There are absolutely no fillers, flow agents, colorants, or any other kind of added ingredient at all – just the best Vitamin D formulation available anywhere. 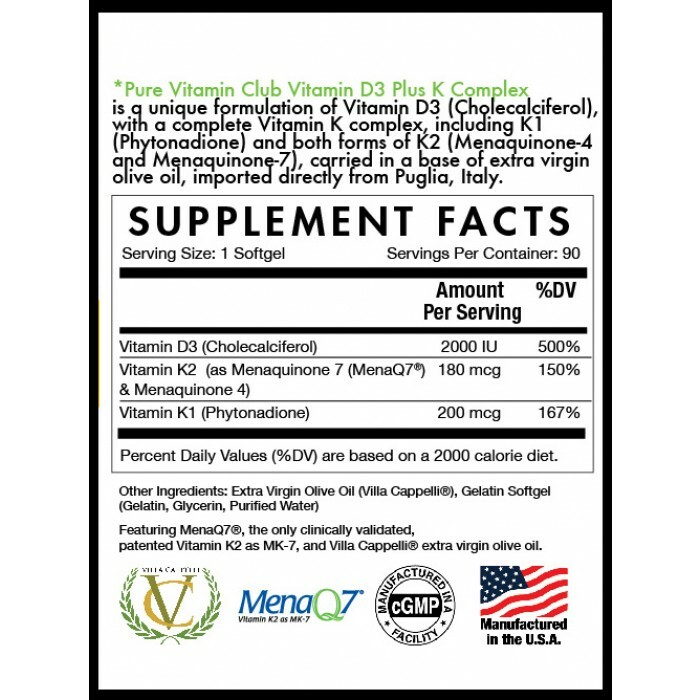 Pure Vitamin Club Vitamin D3 Plus K Complex is a unique formulation of Vitamin D3 (Cholecalciferol), with a complete Vitamin K complex, including K1 (Phytonadione) and both forms of K2 (Menaquinone-4 and Menaquinone-7), carried in a base of extra virgin olive oil, imported directly from Puglia, Italy.